Mini-quilts can be as large or as small as you wish. Free mini-quilt patterns will get you going with fun projects that are quick to sew up and add a splash of color to your room. Make mini quilts as wall hangings, table runners or even tiny bed quilts for a favorite doll or dollhouse. These pint-size piecework productions are fun and satisfying projects that don't take much time or space. 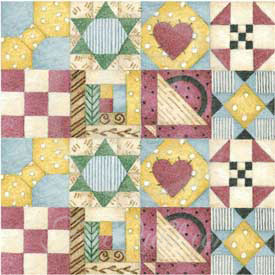 These 12 miniature quilt patterns are in .zip format for you to download.